Directed by Joseph Ruben (The Stepfather, The Forgotten) Dreamscape is about dreaming, going into someone else’s dream and controlling it. If the plot sounds familiar, it’s because it is. The concept has been used to great effect in two other films. The Cell (2000) and Inception (2010) both utilized the plot device of entering another person’s dreams and either controlling or changing them. 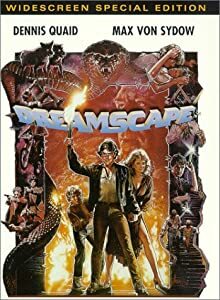 All three films are very different from Dreamscape, but it is obviously this film that spawned the latter two. Starring a young Dennis Quaid (Pandorum, Legion), a younger Max von Sydow (Shutter Island, Minority Report), Christopher Plummer (Up, The Girl with the Dragon Tattoo), Kate Capshaw (Indiana Jones and the Temple of Doom, SpaceCamp) and Eddie Albert (The Longest Yard, Escape to Witch Mountain) the film delivers an entertaining punch. Dreamscape deals with entering dreams via psychic powers and a little help from machinery that lets the psychic know when the target has started the Rapid Eye Movement (REM) that shows they have started dreaming. The film opens with a woman running from what looks like a nuclear blast. The whole scene is surrealistic and the colours run together in a psychedelic fashion. We are watching the United States President (Eddie Albert) have a nightmare. It turns out that he has nuclear nightmares on a regular basis. We then see Alex Gardiner (Dennis Quaid) at the race track. Using his precognitive skills, he successfully picks a long shot to win. When he goes to collect his winnings a gang of crooks try to take his money and make him work for them. Alex evades the crooks and goes home. Once he is there, he gets a phone call from old friend and mentor Doctor Paul Novotny (Max Von Sydow) who wants him to participate in his new dream experiments. To escape the crooks,who have found out where Alex lives, he decides to take up the offer. It turns out that only two of the psychics in the group are skilled enough to really change someone else’s dreams. Alex and a psychotic psychic named Tommy Ray Glatman (David Patrick Kelly). We find out two things about Tommy Ray. We learn that he killed his own father and that he has known Bob Blair a long time. The overall FX of the film have not aged well. The monster was from the Ray Harryhausen school of stop motion. It did not convince at any time. It looked so much like The Golden Voyage of Sinbad, that I reverted to childhood for a brief moment. But apart from feeling nostalgic, I did not get anything from the snake-man. The film features a romance between Quaid and Capshaw. The villain, as portrayed by Christopher Plummer, along with his henchman Tommy Ray makes us want to hiss and boo each time we see him on screen. The film’s plot was entertaining and interesting enough that the dated FX did not spoil it at all. Unfortunately, as I have seen The Cell and Inception recently, I could not help but compare the three films. The Cell dealt more with the technological aspect of entering dreams. Anyone could be hooked up to a machine which would enable them to enter another persons dream. Inception required that both people received injections to make them sleep deep enough that they could enter the trance-like state necessary to enter another’s dreams. I would say that this film is definitely worth watching. If for no other reason than to see what started the whole dream mechanic utilized in the other two films. It’s also got a sterling cast of seasoned actors who deliver solid performances. Dreamscape won’t give you nightmares, but it will entertain you. Previous Previous post: So reddit Will Remove any More Articles About Higgs/CERN?